That’s quite a list. Some of the options are very obvious to be honest. For example healing and rests. Simply changing the timing and durations of these takes you from Epic to Gritty, and you don’t have to be a games developer to work that out. On the other hand there’s some weird stuff, like Speed Factors for initiative, which is up there with Facing for sheer who the heck asked for that? And then there’s the little surprises, like Plot Points which are a pretty modern device to see in D&D, and Trait Proficiency, which basically turns the game into Fate. Well, mostly, but it’s still a big step for this traddest of trad games. There’s definitely some things I’d use from this menu, and some of them I saw back in early playtests. Other things are mutually exclusive (strangely the sanity rules don’t mix with the fear and horror rules), or a bit out there for regular campaigns (alien tech anyone?). This isn’t the kind of thing I imagined back when the designers were talking about a modular approach where fans of every edition could sit next to each other and play the same game happily. It could never have been that, it was an impossible goal. It does give the DM some levers, and if used will absolutely colour their campaign. But let’s not kid ourselves, these are optional hacks, not replaceable modules. For the inveterate tinkerers there’s now a meaty section devoted to custom building your own 5e content. Without any news on an OGL or fan policy, this is largely for the home DM or more likely the person with the collection of old stuff they want to convert. This gives us the maths behind monster creation. Does it work? Don’t know, I don’t have the time or inclination to try it out to be honest, and with all the monster manuals I have to hand, I doubt I ever will. Similarly with magic items. 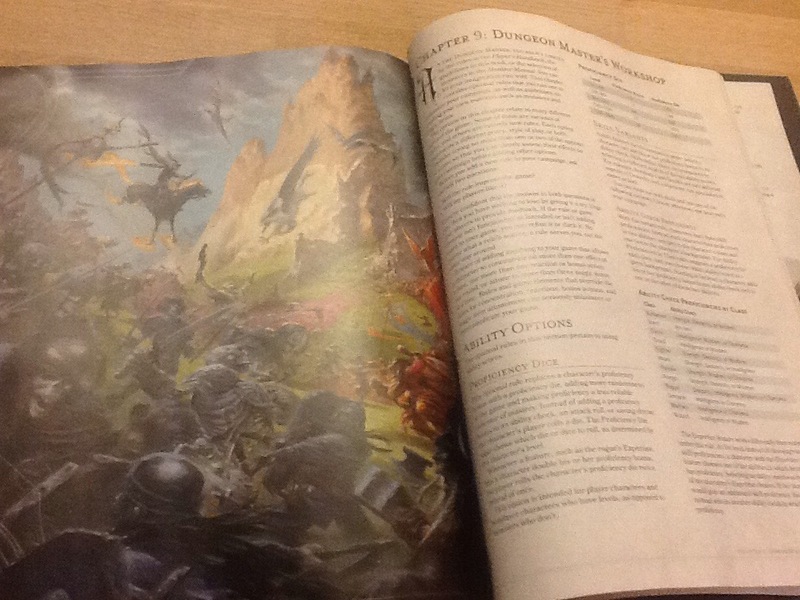 Given that this very book contains hundreds of the buggers, I can’t see any pressing need for me to add to 40 years of D&D content. Same with classes, backgrounds and races, for similar reasons. Look, it’s all there and it appears to go into some depth if that’s the sort of thing you like. Bet you liked the crafting stuff from earlier too right? And that’s it! Almost. Just a few appendices to go. Which is exactly where they manage to take book that had started great and then been slowly downgrading to merely good over its course, and make it awesome. Here’s why. This book has been like a chat with a DM mentor for the past 300 pages. Often it’s been a bit scholarly, and sometimes maddeningly vague. It’s given us loads of further reading, and told us not to worry about anything except the story. It’s had lots of tables, but hasn’t shown us what they can do. Finally, in the appendices, we get the bits that make the whole game work. For starters, random dungeons. When these appeared in 1e, I tried and tried to make them work, never could. These tables do work, and they produce actual maps, that make sense, that you can play with. And they’re a little game themselves for the lonely DM. Such fun. It’s not just there to fill a sheet of graph paper either. It gives you all the things to stock the place with. Essentially, it takes all the starting advice from Chapter 5 and goes bigger (monster motivations) and smaller (contents of a container) at the same time. Appendix B pulls a similar trick, except this time it makes your previous purchase of the Monster Manual entirely worth while. These are the lists by terrain type, and by challenge rating. Now you know what to do with all those beasts, and where to find them. This was a shocking omission from the MM, but seeing it here, it all makes some sense now. It’s the right place. Speaking of which, Appendix C gives you 9 unkeyed maps, of various generic locales. For the harried DM these are gold dust. Yes, the Internet is full of amateur efforts (and strangely this DMG makes zero reference to the online world) but these are the real business. Useful, and bound to appear in a lot of home grown campaigns. Lastly (excepting an index) Appendix D is a sibling to the original Appendix N from AD&D, the inspirational reading list. It’s only a page, and although I don’t recognise many of the titles, the ones I do see, I can’t help but agree with. You see, since the original DMG we’ve had near 40 years of GMimg advice, and it’s become something of a well documented art by now. I don’t think this DMG will ever turn a poor DM into a good one (you need the 4e version for that) but at least it knows it’s limitations and feels confident enough to steer you towards other works on the subject. Good for them. I feel like this book should have had a foreword/afterword. I’d have liked to hear directly from the current custodians of the line now that the core trinity is finished. I know they did some last minute work on this book, but I hope it made it better. I actually think it could have done with a light trim in some areas, and expansion in others, but hey, we’re all armchairs editors when it comes to D&D right? My final thoughts? There’s so much to admire here. It’s not perfect, and that shows up most starkly when it tries to be all things to all DMs. Which is 5e all over. But it does do exactly what it says on the back cover “entertain and inspire your players”. To achieve that, first of all the book had to entertain and inspire me, to which I can do nothing but admit, it did. Welcome back, D&D.